Even though the Tathagata-garbha is “within” all sentient beings, it is still plagued by a series of kleśas that soil and keep it dormant until efficacious Buddha-qualities peel-away the damning-sheathes. The Ratna gives nine-examples of these defilements that are by their very nature adventitious. Once un-sheathed, the unadulterated Buddhadhātu shines through. The nine are taken directly from the Tathagata-garbha Sutra. This is a prime example of how the Ratnagotravibhāgaśāstra is compiled from a wide array of Tathāgata-scriptures. Now we shall take into consideration “the coverings of defilement” which, existing without beginning, are essentially unconnected (with the pure Spiritual Essence), and the Absolute Essence which likewise has no beginning, but is perfectly pure and connected (with the spirit of every living being). Here, in accordance with the (Tathagatagarbha-sutra), we have the Essence of the Buddha, as it is concealed by the innumerable coverings of defilement, illustrated by 9 examples. What are these nine? In the living beings obscured by the occasional stains. Triumphantly appears in the world. 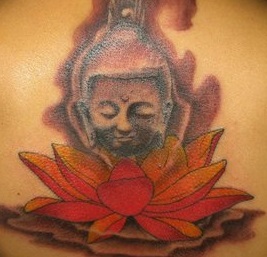 Imagine an ugly closed-calyx of a diseased lotus flower harboring an unsoiled Buddha-statue within. Someone who is possessed with the marvelous gift of clairvoyance can peer-straight-through the soiled lotus-covering and deliver the statute from its stained-womb. In a similar fashion, the mystically-endowed Munis can freely and clearly discern the perfect-nature of Buddhahood dwelling within all sentient beings, thereby extracting them free from their ignominious shell. To first get rid of the swarm. Is like the honey in a cave or tree. That keep one from getting to it. Picture how honey is present in the path of a surrounding swarm of bees. Upon the arrival of a skillful person who directly knows how to carefully separate the honey from the bees, the delicious substance is then soon readied for sale. Similarly, the Buddha, yea the ShakyaMUNI with his all-pervading Dharma-Eye, transcendentally perceives how the Buddha-Element (Gotra) is covered by those swarming defilements and magnificently extracts the pure Bodhi-Element thus producing the Immaculate-manifestation of the Dharmakaya. And said to be something to be discarded. The inside is genuine and not to be destroyed. It becomes food fit for a king. Have a buddhagarbha hidden by kleshas. To enable them to attain universal wisdom. Just as a grain of rice is encapsulated within the shell of its husk and is not fit for eating before sentient beings remove the husk in order to obtain the palpable-food, just-so must the spirit of the Dharma-Lord become unhusked in order to freely distribute the taste of the Buddhadharma to all sentient beings, thus empowering them to discern their own participation in the Tathagata-dhatu. Are quickly removed and beings are purified. Fashion in your mind’s eye someone venturing-forth on a long journey and quite unawares loses some pure-gold from his pocket and it soon becomes indistinguishable from a lying piece of rubbish. It remains so for countless kalpas until a god-like being with clairvoyance points someone in the right direction in order to procure this forgotten treasure. Similarly the omniscient Shining Ones can free sentient beings from the rotting-filth of their mental poisons by expounding the Truth of the Buddhadharma, thus cleansing them from their defiled-garbha and empowering them to discern and claim their rightful treasure of the Buddha-dhatu. 5. Or, kulaputras, it is like a store of treasure hidden beneath an impoverished household. The treasure cannot speak and say that it is there, since it isn’t conscious of itself and doesn’t have a voice. So no one can discover this treasure store. It is just the same with beings. But there is nothing that the power of the Tathagata’s vision is afraid of. The treasure store of the great dharma is within beings’ bodies. It does not hear and it is not aware of the addictions and delusions of the five desires. The samsara cakra turns and beings are subjected to countless duhkhas. Therefore Buddhas appear in the world and reveal to them the Tathagata-dharmagarbha in their bodies. And they believe in it and accept it and purify their universal wisdom. Everywhere on behalf of beings he reveals the Tathagatagarbha. And inevitably a great tree grows. Is just like the seed within a flower or fruit. None of which can be destroyed. Just as a fruit grows into the most regal of trees. Recollect that a miniscule-seed has the potential to develop into a mighty-tree. Initially, one cannot envision the tree dormant in the tiny seed, but employing the right conditions like water and sunlight, the resilient-tree will take root and develop to its full potential. In like-fashion, the Bodhi-seed (gotra) is initially encased under the dirt of ignorance accompanied by many weeds of emotional and cognitive obscurations. If one develops the necessary Buddha-gnosis, then the Bodhi-seed will mature into a Mighty Bodhisattva enroute to full Tathagatahood. 7. Or, kulaputras, it is like a man with a statue of pure gold, who was to travel through the narrow roads of another country and feared that he might be victimized and robbed. So he wrapped the statue in worn-out rags so that no one would know that he had it. On the way the man suddenly died, and the golden statue was discarded in an open field. Travelers trampled it and it became totally filthy. But a person with supernatural vision saw that within the worn-out rags there was a pure gold statue, so he unwrapped it and all paid homage to it. Similarly, kulaputras, I see the different beings with their many kleshad, transmigrating through the long night of endless samsara and I perceive that within their bodies is the wondrous Tathagatagarbha. They are august and pure and no different from myself. For this reason the Buddha expounds the Dharma for beings, that they might sever those kleshad and purify their Tathagata jnana. I turn the Dharmacakra again and again in order to convert all worlds. A valuable Gold Buddha Statue wrapped in torn garments and left by a forsaken roadside would be unnoticed by unwary travelers, but instantaneously recognized beneath all the filth by a Noble Shining One who teaches the means whereby the Dharmadhatu is released from its adventitious wrappings. Just so would they inform sentient beings how to discard their soiled samsaric-garbs for the full splendor of the Tathagatakaya. Who will become a Cakravartin king. Picture a poor destitute woman dwelling amongst the most wretched of conditions being full of misery and despair, yet unaware that she bears within her womb a blessed Noble Child, chooses to remain in abject poverty of mind and spirit. Likewise the sentient being who chooses to live in similar fashion by rejecting their own inner Bodhichild thus remaining and suffering from the awful vicissitudes of samsara. And see only the darkened earthen molds. And opens them to extract their contents. And the features clearly revealed. I see that all beings are like this. And convert in turn all other beings. Imagine a very pure Buddha-statue covered with a crusty-scab of clay. The one who is privy to the True Substance lying beneath is able to reveal its Rightful Import. Similarly the Noble Shining Ones clearly see beneath the defiled-garbha that encrusts the Luminous Nature of the Unborn Mind; through teaching the Right Path all the impurities are gradually removed from the dysfunctional mind. This entry was posted in The Ratnagotravibhāgaśāstra and tagged bodhichild, Buddha-dhatu, clay-covered gotra, diseased lotus flower, hidden treasure, impoverished woman, kernels, Munis, small seed, soiled garment, soiled treasure, swarming bees, Tathagata-dharmagarbha, Tathagata-dhatu, Tathagata-garbha Sutra, Tathagatakaya. Bookmark the permalink.